When Lee moved to Utah so his wife could return to where she grew up, he had no idea he would be a volunteer working on the restoration of the Denver & Rio Grande steam engine #223. He had spent five years making traction motors for the big EMD diesels but that was far removed from steam engines. He later went into law enforcement where he says, “If you saw it on TV, I’ve done it”. To hear his stories, you can believe the truth in them. He has no relatives who toiled on a working railroad. Lee has a home wood shop so he brought hands on knowledge to the project. By jumping into his volunteering on the #223, he has become proficient in many of the tasks demanded by the restoration of a steam engine and the construction of a new tender. 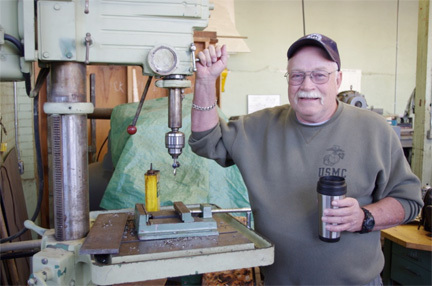 When asked what he has learned on the project he states, “Just how much he doesn’t know about the many talents necessary to be useful in the shop”. He looks up to the men of the early days of building rolling stock and how they got the job done without the convenience of modern tools. Lee believes that Americans have a short memory when it comes for our history, and the completion of #223 will help them remember.